Rainforests are huge carbon sinks that release oxygen into the atmosphere. ​Every human and animal on the planet needs this oxygen in order to breathe and survive. Rainforest reforestation efforts are sprouting up all around the world. Numerous conservation groups are working to preserve, enlarge and connect the world's rainforests. Private sponsorship of forests is increasing. The Grow Project is one of those projects. 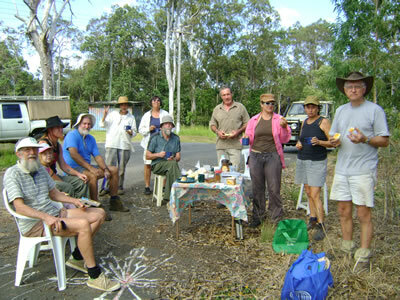 Kuranda Envirocare had planted 1120 trees through private sponsorship since October 2011. ​The Grow project is the brainchild of Kimba Bueltner, a local girl who grew up in Kuranda and is now living in the USA with her husband. It's a way of sponsoring native rainforest trees to be planted, providing carbon offsetting and habitat for threatened species. ​Businesses, individuals and groups are all welcomed to get involved. Gift Vouchers can be given offering trees as an environmental gift giving choice. All funds are 100% tax deductible. Our Grow Project sites are all in the Australian Wet Tropics, containing some of the most biodiverse ecosystems in the world. The revegetation team of Kuranda Envirocare plant the sponsored trees in a site specifically monitored for the Grow Project. ​Trees are maintained until they form a canopy cover and have excluded competing weeds. From then on they're maintained yearly for 5 year and after that the planting should be self sustaining . ​Sites are preferably established on local council or state land where we can be assured the trees will not be removed, once planned. ​Sites may be established on private property but only if a covenant is entered into by the land holder, to provide the same protection for newly planted trees as if they were already part of an established rainforest. It takes a few hundred years before a mature rainforest becomes established.